Slow Dance Night: A Midsummer's SLOWDANCE NIGHT in Toronto! A Midsummer's SLOWDANCE NIGHT in Toronto! A Midsummer's SLOW DANCE NIGHT in Toronto! It's high school with a happy... ending, and it's queer, senior, and couple-friendly too. Come and experience why slow is beautiful, and why love is not ironic. Dovercourt house 805 Dovercourt Rd. (1 block North of Bloor, 3 blks. west of Ossington) Saturday, August 14th, 2010 Doors at 9:00, Dance from 9:30 PM - 2 AM. $10 admission includes your Dancecard-booklet! A NOTE ABOUT THE DANCE CARDS: The dancecards are these little booklets that contain a setlist of every song that will be played that evening. The idea is that during the course of the evening, you can "book" certain songs with certain people, and vice versa. So when your charming hosts announce a particular song, you can look on your dancecard and see who it is you're going to dance with next. There is a little space after every song where people can write their names. How filled your dancecard gets depends on you, of course. Ask someone to dance! Or give someone meaningful looks! Look for the Dancecard-Signing Station located somewhere on the premises, usually near a light, where small pencils are available. The dancecards also - thoughtfully - have lots of empty places where you can write down the names and numbers of charming people whom you may have danced with that night. Use of the dancecards, is, of course, optional, and completely up to you. Proceed at your comfort level. 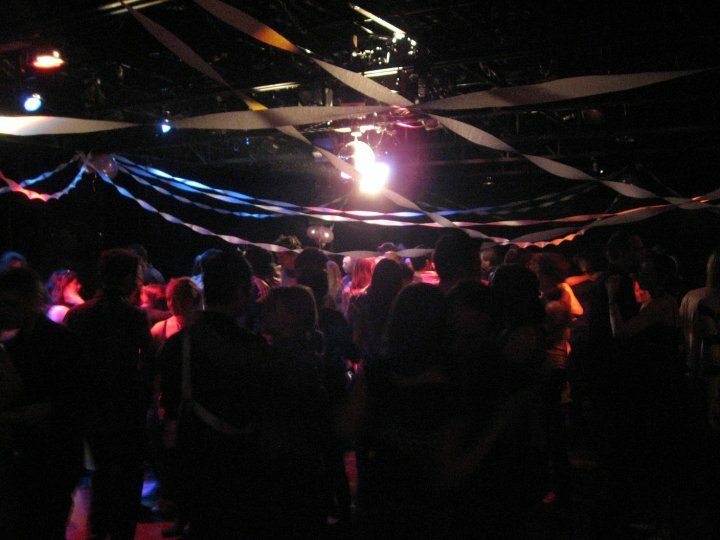 A NOTE ABOUT THE RULES OF ENGAGEMENT: The Rules essentially state that as someone coming to Slow Dance Night, you have the right to ask anyone you want to dance. But whoever it is you asked has the right to refuse your request, and not have to give any reason why. But wonderfully, you have this right as well. This is done because slowdancing with someone is rather an intimate sort of enterprise, and a minor commitment, and you should have the right to back out anytime you wish. Slow Dance Night is about consensual respect and enjoyment. Just because you may have danced with someone for most of the song, if at any point you are feeling unsafe or uncomfortable, you can simply walk away. If whoever it is persists in their attention, locate one of the organizers, and they will be ejected from the premises. And fucked-up. Anyone who refuses to comply by the rules will be fucked-up. A NOTE ABOUT THE DESIGNATED DANCERS: On any particular night there will be a handful of our Designated Dancers available to dance with you. They will be wearing shiny gold or powder blue sashes, and these Designated Dancers' are warm, charming, and safe people to ask to dance. Of course, the same Rules of Engagement apply, and they, as free agents, can decide for themselves who they want to dance with, and for how long, but in all likelihood, they would be very open to dancing with you. Please think of them as a warm taxi light in the middle of a blizzard; the cast of a lighthouse, when you are too far from shore and shrouded in fog; a glimmer of hope after a lifetime of desolation. Well, actually, that might be pushing it. Please think of them as a temporary safe harbour. They will also be looking for you, and asking you to dance, trying in their way to turn wallflowers into perennials. Finally, we are always looking for designated dancers for our evenings. If you are outgoing, warm, and willing to undertake the very serious duty and responsibility of inviting wallflowers out onto the dancefloor - if in fact, such a prospect gives you great joy - then please contact the organizers at inconsolablecat@hotmail.com.